Designed by Pete Dye, Bobby Weed and player consultant Jerry Pate, Dye’s Valley Course at TPC Sawgrass is the sister track to the world-famous THE PLAYERS Stadium Course. Opened in 1987, Dye’s Valley Course is scheduled to host the Web.com TOUR Championship in 2013. The Dye’s Valley Course at TPC Sawgrass has had its share of legends competing on its fairways. The golf course has hosted prestigious events like the Senior Players Championship, the NFL Golf Classic, and the final stage of Senior Qualifying School. 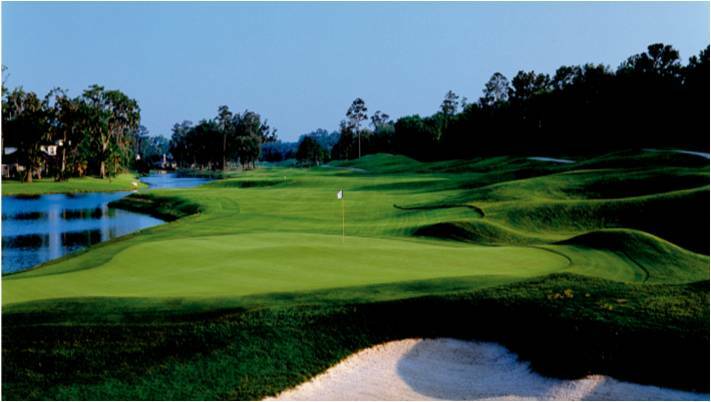 The Dye’s Valley also hosted the Winn-Dixie Jacksonville Open presented by Planters in 2010 – 2012. Boasting perfectly manicured surfaces and water on every hole, Dye’s Valley was ranked No. 24 in Golfweek’s 2011 rankings of “Best Courses You Can Play” in Florida. With the same standards of excellence found at The Stadium Course, but a quieter, unassuming feel, Dye’s Valley Course rounds out a complete experience at TPC Sawgrass. Many players welcome the “respite” of this golf course after a round on The Stadium Course, which was built to test the fortitude of PGA TOUR professionals. Seasoned and casual golfers can benefit from the design of this golf course with wider fairways and larger greens. This is still a challenging golf course as water comes into play on 14 holes. There is even a chance for the long hitters to potentially reach some of the par 5 holes in two. Golfers will also enjoy a less-crowded golf course, and likely a faster round, as well on Dye’s Valley Course.